Israeli forces killed a Palestinian civilian while arresting him without endangering the soldiers’ life. 10 shooting incidents targeting the Palestinian fishing boats off the Gaza Strip Shore were reported. Israeli naval forces killed a Palestinian fisherman and wounded and arrested 2 others in addition to causing damage to the boat. 39 Palestinian civilians were wounded, including 8 children, in the West Bank and Gaza Strip. Shooting at the border areas in the Gaza Strip was reported without causing any casualties. Israeli forces conducted 56 incursions into Palestinian communities in the West Bank and 2 similar ones into Jerusalem. 47 civilians, including 10 children and a woman, were arrested in the West Bank. 4 of them were arrested in Jerusalem. 2 Palestinians were arrested after attempting to sneak into Israel. Israeli continued their attacks against Palestinian civilians, wounding a civilian after throwing a stone at his head. The Israeli municipality impose the “Arnona” property tax on the church-owned properties in the City. Israeli forces imposed a general closure on the oPt for Purim. Israeli violations of international law and international humanitarian law in the oPt continued during the reporting period (22 – 27 February 2018). At approximately 01:00, Israeli forces moved into Jenin refugee camp, west of Jenin. They raided and searched a number of houses and then arrested 4 civilians namely Mo’ath Abdul Latif Fayed (22), Na’im Jamal al-Zubaidi (23), Yahiya Jamal al-‘Anteer (22), and Khalil Mohammed al-Hendi (24). At approximately 02:00, Israeli forces accompanied with 3 military vehicles moved into the Schools intersection area on al-Salam Street in the centre of the city. They raided and searched a house belonging to ‘Arafat Ibrahim al-Qawasmi (35) and then arrested him. At approximately 03:00, Israeli forces moved into ‘Anabtah village, east of Tulkarm. They raided and searched a number of houses and then arrested Mahmoud Abdul Ra’ouf Fahmawi (32). At approximately 03:45, Israeli forces moved into Noor refugee camp, east of Tulkarm. They raided and searched a number of houses and then arrested Hilal Ahmed Theeb Husein (30) and Ahmed Yusuf Shehadah (32). Around the same time, Deir Estia village, northwest of Salfit. They raided and searched a number of houses and then arrested 4 civilians, including 2 brothers, namely ‘Attaf Sa’ed Hasan al-Qadi (26), Yusuf Mohammed ‘Ayed al-Qaisi (22), Khalil Mahmoud Khalil Hakim (25) and his brother Tha’er (23). In new crime of extra-judicial executions, which reflects Israel’s disregard for the lives of Palestinian civilians , Israeli forces killed on dawn a Palestinian civilian in Jericho when they carried out an arrest campaign. They announced his death few hours later after of arresting him. According to PCHR’s investigations and eyewitnesses’ accounts, at approximately 04:30, Israeli forces moved into Jericho. They raided and searched a house belonging to Khamis Hattab in the center of the city after breaking down the main house door in addition to damaging some of the house contents. His nephew, Yassin ‘Omer al-Saradih (33) headed to the house to figure out what was going on. However, immediately, a number of Israeli soldiers severely beat him up throughout his body and then fired a tear gas canister on the spot. They then pulled him on the ground to a military vehicle and later to an unknown destination. At approximately 09:30 on the same day, the family received a phone call from the Palestinian Military Liaison telling then that the Israeli Liaison informed them of the death of their son due to suffering gas inhalation and seizures. A video captured by a surveillance camera showed 6 Israeli soldiers attacking the abovementioned civilian and brutally beating him up using their riffles’ butts and feet. Two persons were having discussion in the video about the type of firearm used by the Israeli soldiers during the arrest campaign as one of them said that the weapon was a firearm not a tear gas canister. On Friday, 23 February 2018, the Commission of Detainees and ex-Detainees Affairs said in a statement published on its official website quoting Dr. Rayan al-‘Ali, who participated in the corpse autopsy in National Institute of Forensic Medicine “Abu Kabir” that al-Saradih was hit with a live bullet to lower abdomen that was shot by the Israeli soldiers at point-blank range. The commission added that the bullet caused severe bleeding and rapture of right iliac artery and right iliac vein and exited from the back. The commission also said that the autopsy revealed a fracture in the pelvis in addition to bruises in the head, chest, neck and shoulders. At approximately 12:35, Israeli gunboats stationed off al-Waha shore, northwest of Beit Lahia in the northern Gaza Strip, heavily opened fire at Palestinian fishing boats sailing within 4 nautical miles and chased them. As a result, the fishermen were forced to flee fearing for their lives, but neither casualties nor material damage was reported. At approximately 20:10 Israeli forces moved into Qalqiliyah. They raided and searched a house belonging to Mohammed Ma’zouz Mohammed Dawoud (13) and then arrested him. At approximately 20:30, a group of Israeli undercover agents “Mosta’rebeen” dressed like Palestinian civilians sneaked into Birzeit village, north of Ramallah, and stationed near the main entrance to Birzeit University. They opened fire at a Palestinian car travelled by Omer Mahmoud al-Kaswani (20) and then withdrew from the village. However, no casualties were reported. Note: During the aforementioned day, Israeli forces conducted (7) incursions in the following areas and no arrests were reported: Dura and Rabud village in Hebron; Ya’bud village, southwest of Jenin; Kafel Hares village, north of Salfit; Qalqiliyah and ‘Azzoun village, east of the city; and ‘Anabtah village, east of Tulkarm. At approximately 00:15, Israeli forces moved into Deir Estia village, northwest of Salfit. They raided and searched a house belonging to Sharaf Dawoud ‘Obaid (20) and then arrested him. It should be noted that the Israeli forces previously arrested Sharaf’s brothers Mustafa and Ashwas. At approximately 01:00, Israeli forces moved into al-Khader village, south of Bethlehem. They raided and searched a house belonging to the family of prisoner Abdul Men’im ‘Omran Salah and then arrested his wife Neven Salah (32) and his father Mohammed ‘Omran Salah (67). It should be noted that Abdul Men’im is detained in the Israeli prisons for more than 2 years without a trial. At approximately 18:30, Israeli gunboats stationed off al-Waha shore, northwest of Beit Lahia in the northern Gaza Strip, heavily opened fire at Palestinian fishing boats sailing within 4 and 5 nautical miles and chased them. The shooting recurred at approximately 19:00 on the same day. As a result, the fishermen were forced to flee fearing for their lives, but neither casualties nor material damage was reported. Around the same time, Israeli gunboats stationed off al-Sudaniyah sore, west of Jabalia in the northern Gaza Strip, heavily opened fire at Palestinian fishing boats sailing within 4 nautical miles and chased them. As a result, the fishermen were forced to flee fearing for their lives, but neither casualties nor material damage was reported. At approximately 15:30, Israeli forced moved into Salem village, northeast of Nablus, amidst firing sound bombs. A number of Palestinian youngsters gathered and threw stones at Israeli soldiers. The soldiers fired live and rubber bullets at them. As a result, 3 civilians were wounded. Two of them were hit with live bullets and one was hit with live bullet shrapnel to the neck. Note: During the aforementioned day, Israeli forces conducted (7) incursions in the following areas and no arrests were reported: Halhoul, Bani Na’im and Deir Samet villages in Hebron; Tulkarm and Noor Tulkarm refugee camps, east of the city. At approximately 01:00, large numbers of Israeli forces accompanied with a group of undercover agents “al-Mosta’aribeen” dressed like Palestinian civilians and backed by a drone moved into al-Dheisheh refugee camp, south of Bethlehem. At the beginning, the undercover agents sneaked into the camp. They raided and searched a house belonging to Abu ‘Ajamiyah Family and then arrested Akram ‘Omran al-Atrash (23), whom the Israeli forces have been chasing since September 2017 after he suffered wounds to the shoulder, abdomen and lungs when the Israeli forces moved into the camp and opened fire at him in April. He received medical treatment in several hospitals, but his injury did not prevent his arrest. The Israeli forces continued to chase Akram and applied punitive measures against his family through raiding their house several times and arresting his father to pressurize him to surrender. During the incursion, dozens of Palestinian civilians gathered and threw stones and empty bottles at the Israeli soldiers. The soldiers fired live and rubber bullets and tear gas canisters at them. As a result, a civilian was hit with a live bullet to the leg. At approximately 01:30, Israeli forces moved into al-Hawouz area in Hebron. They raided and searched a house belonging to Mo’atasem Mohammed al-Natshah (20) and the arrested him. At approximately 03:30, Israeli gunboats stationed off al-Wahah shore, northwest of Beit Lahi in the northern Gaza Strip, heavily opened fire at Palestinian fishing boats sailing within 3 nautical miles and chased them. As a result, the fishermen were forced to flee fearing for their lives, but neither casualties nor material damage was reported. At approximately 06:00, Israeli gunboats stationed off al-Wahah shore, northwest of Beit Lahi in the northern Gaza Strip, heavily opened fire at Palestinian fishing boats sailing within 4 and 5 nautical miles and chased them. The shooting recurred at approximately 06:20 and continued until approximately 07:30 on the same day. As a result, the fishermen were forced to flee fearing for their lives, but neither casualties nor material damage was reported. At approximately 09:15, Israeli gunboats stationed off al-Sudaniyah sore, west of Jabalia in the northern Gaza Strip, heavily opened fire and pumped water at Palestinian fishing boats sailing within 4 nautical miles and chased them. The shooting recurred at approximately 11:30 on the same day. As a result, the fishermen were forced to flee fearing for their lives, but neither casualties nor material damage was reported. At approximately 18:10, Israeli forces stationed along the border fence between the Gaza strip and Israel, east of Khan Yunis in the southern Gaza Strip, fired flare bombs over the border area, east of al-Qararah along with opening fire in the area. The Israeli authorities declared later that they arrested 2 Palestinian civilians (they were not identified until the reporting period) while attempting to sneak into Israel and took them for investigation. Note: During the aforementioned day, Israeli forces conducted (5) incursions in the following areas and no arrests were reported: ‘Anabtah village, east of Tulkarm; Halhoul, al-Burj, Beit Awla, and Ethna villages in Hebron. At approximately 06:20, Israeli gunboats stationed off al-Waha shore, northwest of Beit Lahia in the northern Gaza Strip, heavily opened fire at Palestinian fishing boats sailing within 3 nautical miles and chased them. As a result, the fishermen were forced to flee fearing for their lives, but neither casualties nor material damage was reported. At approximately 07:00, Israeli forces moved into Taqou’ village, east of Bethlehem. They closed the northern entrance to the village in both directions and stopped students of Taqou’ Secondary School for Boys amidst firing sound bombs at them in an attempt to obstacle the education process. The Israeli forces carried out a wide-scale incursion in the village. They raided and searched a number of houses and then arrested Mohammed ‘Adel al-Sha’er (16) and Mahmoud Thyab al-‘Amour (16). The Israeli forces also handed Saif Mahmoud al-‘Amour (12) a summons to refer to the Israeli Intelligence Service in “Gush Etzion” settlement complex, south of the city. In the evening hours, Israeli naval forces killed a Palestinian fisherman after opening fire at a fishing boat sailing in Gaza Sea. The shooting led to wounding 2 fishermen, who were arrested, and damaging the fishing boat. Mahmoud ‘Adel Abu Riyalah (19), from Gaza City, who was wounded in this attack said to PCHR’s fieldworker that, at approximately 15:30, Israeli gunboats chased a Palestinian fishing boat manned by Isma’il Saleh Abu Riyalah (18) and ‘Ahed Hasan Abu Riyalah (24). The fishing boat was sailing within 3 nautical miles off Gaza City shore when the Israeli naval forces heavily opened fire at it. As a result, Isma’il Saleh Abu Riyalah was hit with a live bullet to the head and then succumbed to his wounds, while Mahmoud Abu Riyalah was hit with a rubber bullet to the leg. Additionally, ‘Ahed Hasan Abu ‘Ali was hit with a rubber bullet to the leg and the fishing boat manned by all of them sustained damage. Mahmoud Abu Riyalah added that the Israeli naval soldiers forced them to take off their clothes, jumped into the water and swim towards the Israeli gunboat. They also arrested and questioned him and ‘Ahed Abu Riyalah, but released them at approximately 20:00 on the same day. Note: During the aforementioned day, Israeli forces conducted (3) incursions in the following areas and no arrests were reported: Yatta, al-‘Aroub refugee camp and al-Harya Valley in Hebron. At approximately 00:00, Israeli forces moved into Bethlehem and stationed on al-Saf Street in the center of the city. They raided and searched a number of houses and then handed summonses to 3 civilians to refer to the Israeli Intelligence Service in “Gush Etzion” settlement complex, south of the city. The civilians were identified as Abdul Salam Khader al-Haremi (27), Mohyee Eden Hassan (21) and Mohammed Suleiman Suman (26). At approximately 01:30, Israeli forces moved into Nablus. They raided and searched a number of houses and then arrested Omer Mahmoud Samarah (22). Around the same time, Israeli forces moved into ‘Askar al-Qadeem refugee camp, northeast of Nablus. They raided and searched several houses and then arrested ‘Amid ‘Emad Banat (19). At approximately 02:00, Israeli forces moved into Tal village, southwest of Nablus. They raided and searched a number of houses and then arrested ‘Asem Hasan Ayoub ‘Asidah (23), Zaid Ahmed al-Bana ‘Asidah (19), and Mahmoud Abdul Karim Ramadan (19). Around the same time, Israeli forces moved into Hebron. They raided and searched several houses and then arrested ‘Ezz Eden Mustafa Abu Husein (20) and Mo’atasem Asmar al-Natshah (19). At approximately 04:30, Israeli forces moved into al-Nabi Saleh village, northwest of Ramallah. They raided and searched dozens of houses and then arrested 10 civilians, including 7 children. Mohammed Fadel Tamim al-Tamimi (15) was among the arrestees. At approximately 12:00 on the same day, Israeli forces released Mohammed after they interrogated him in ‘Ofer Prison in Betunia village, west of Ramallah. It should be noted that Mohammed was hit with a rubber bullet, which settled in his head, by the Israeli forces when he participated in a peaceful protest at the main entrance to the village on 15 December 2017. Doctors conducted several long and complicated surgeries that ended with removing the rubber bullet and swallows in the brain, ears, nose and throat. However, the doctors had to remove part of the skull. Mohammed will have a surgery to Reconstruct the skull on Monday, 05 March 2018. Moreover, the other arrestees were identified as Tamim Fadel al-Tamimi (17), Mo’ayad Hamzah al-Tamimi (17), Ahmed Sami al-Tamimi (24), Islam Omer al-Tamimi (20), Omer Saleh al-Tamimi (24), Amjad Abdul Hafith al-Tamimi (15), Soheib Samih al-Tamimi (15), We’am Eyad al-Tamimi (17), andMohammed Mojahed al-Tamimi (15). Note: During the aforementioned day, Israeli forces conducted (8) incursions in the following areas and no arrests were reported: Yatta, Hebron, al-Samou’ and Joyous village, north of Qalqiliyah; Qafin, Zeta, Beit Led and Safarin in Tulkarm. At approximately 01:00, Israeli forces moved into Jama’in village, south of Nablus. They raided and searched a number of houses and then arrested Abdul Rahman Jihad Shuhadah (25). At approximately 01:30, Israeli forces moved into Deir Samet village, southwest of Dura, southwest of Hebron. They raided and searched a house belonging to Ayman Mahmoud al-Haroub (28) and then arrested him. At approximately 04:20, Israeli forces moved into al-Jalazoun refugee camp, north of Ramallah. They raided and searched several houses and then arrested Marwan Mahmoud al-Shani (22), Mohammed Ahmed Abu Roweis (19) and Feras Jaber al-Shu’ani (25). At approximately 07:30, Israeli forces accompanied with 4 bulldozers and 2 tanks moved about 100 meters into the west of the border fence, east of al-Salqa Valley village, east of Deir al-Balah in the center of the city. The bulldozers leveled lands adjacent to the border fence between the Gaza Strip and Israel. The incursion continued until approximately 12:00 on the same day when The Israeli forces redeployed along the border fence. At approximately 10:15, Israeli forces accompanied with a number of military vehicles moved about 100 meters from “Kissufim” military site, east of al-Qararah village, east of Khan Yunis in the southern Gaza Strip. They leveled the lands in the area and headed to the border fence between the Gaza Strip and Israel amidst sporadic shooting at agricultural lands in the area. However, no casualties were reported. At approximately 12:30, an Israeli police car was driving near al-Laban al-Sharqiyah village on Ramallah – Nablus Street, south of Nablus. The police officers saw a car on the Abovementioned Street, and then ordered the driver Sa’ed Rezeq Mahmoud ‘Oudah (30) to stop. Sa’ed did not obey the orders and entered the village. one of the police officers then opened fire from his car at Sa’ed’s car when he was near the iron gate established at the village entrance. The bullet penetrated the rear window of the car and hit Sa’ed and settled in his back. Sa’ed was taken to Qablan Medical Center and then referred to Rafidiya Hospital in Nablus where he underwent an urgent surgery. Doctors classified his injury as stable. The Israeli police could have opened fire at the car tires and then arrested the driver to investigate with him without endangering his life. 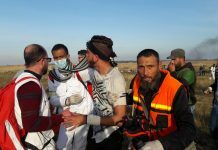 At approximately 15:00, Israeli soldiers stationed along the border fence between the Gaza Strip and Israel, east of Deir al-Balah in the central Gaza Strip, opened fire at shepherds. As a result, the shepherds were forced to leave the area fearing for their lives, but no casualties were reported. Note: During the aforementioned day, Israeli forces conducted (4) incursions in the following areas and no arrests were reported: Dura, Hebron, Ethna and Beit Ummer villages. Note: Due to technical issues, PCHR could not as well get the official statistics from th department responsible for issuing such statistics for this week. On Thursday 22 February 2018, Israeli forces established 3 checkpoints at the entrance to al-Nabi Saleh village, northwest of Ramallah; at the entrance to Ni’lin village, west of the city; and at the entrance to Kafur Malek village, northeast of the city. On Thursday 22 February 2018, Israeli forces established 4 checkpoints at the entrances to Beit ‘Awaa and Ethna villages, at the entrance to al-Fawar refugee camp; and at the western entrance to Hebron. On Friday, 23 February 2018, 2 similar checkpoints were established at the northern entrance to Hebron and at the entrance to Beit Kahel village. On Saturday, 24 February 2018, Israeli forces established 3 checkpoints at the eastern entrance to Dura village, at the entrances to Beit Ummer village, at the entrance to al-Fawar refugee camp. On Sunday, 25 February 2018, 4 similar checkpoints were established at the entrance to al-Fawar refugee camp, at the entrances to Dir Razeh and Karmah villages, and on Khelit al-Maiyah Road. On Monaday, 26 February 2018, Israeli forces established 4 checkpoints at the entrance to al-‘Aroub refugee camp, at the entrance to Ethna village, at the northern entrance to Yatta village, and at the southern entrance to Hebron. On Tuesday, 27 February 2018, 6 similar checkpoints were established at the entrances to ‘Abdah and Karmah villages, at the southern entrance to Hebron, on al-Fahs Road, at the entrance to Samou’a village, and at the eastern entrance to Yatta village.